Ask fellow campers about "Trail River Campground - Chugash National Forest" and nearby attractions. Beautiful campground. Interior roads are paved and it's easy to maneuver a larger rig. The sites are quite spacious and well separated from one another. 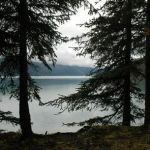 The campground is a mile off the Seward Highway but sometimes traffic noise can be heard if you're outside. Even though it's 24 miles north of Seward my wife and I decided to stay here after seeing the wretched "parking lot" places in Seward. We camped at Trail River Campground - Chugash National Forest in a Fifth Wheel. Very scenic campground with mountains all around, a few sites near Kenai Lake, and a few other sites near Trail River. A number of good hiking trails are nearby. It’s a forest service campground with no hookups. There are pit toilets, they are kept very clean. We camped at Trail River Campground - Chugash National Forest in a Motorhome. Are you affiliated with Trail River Campground - Chugash National Forest ?